Flat to positive opening is expected ..place AMO sell order at 6717 tgts in step of 17 to 23 as per your digestion …if u are able to pay big MTM keep ur short for 300 Nifty points …means 6420 but for that do not let me know that you want sl of 6741 …yes we will trail it when opportunity will be there here is only speculation that indicators are not supporting up move in prices so correction must be there and it will not be healthy or smaller one a big one can not be ruled out …wait for that moment ..
Nifty eod chart ended making spinning top all other indicators are trading over bought . Flat to positive opening is expected with profit booking at higher levels market may trade with increased volatility and wild moves can not be ruled out in many stocks . positive to gap-up opening is expected with choppy session ahead of last but 1 day to expiry . nifty able to maintain status quo 0.9% positive close after gap down ..will it close positive today also ??? short Apr Nifty at 6650 6665 at open for positional target 6360 6100 5950 if nifty won’t be able to sustain outside of channel it may move towards bottom of channel… negative to gap down opening is expected with profit booking mood expect 60 to 80 points down side move in nifty today …as it is expiry volatility so keep some what wide stoploss orders . 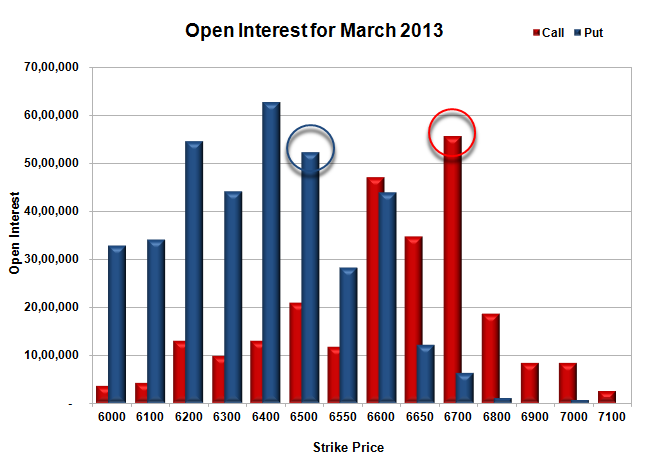 Gap up opening is expected with choppy session ahead as expiry week started and big players /options writers will try to encash full decay benefit in options prices ..
Money flow index is creeping down .positive to gap up opening is expected with gap filling possibility charts and FIIs inflow are not coinciding …FIIs were net buyers since 17 Feb where as chart is showing that that smart money is going out http://www.moneycontrol.com/stocks/marketstats/fii_dii_activity/index.php what is true we will come to know very soon … chart is not supporting bulls nor bears and range trading is going on since 8 sessions …maximum indicators turning bearish at eod Nifty chart . Trade with stoploss order …please note that always place stoploss order by increasing 0.1 to 0.2 % above or below advised stoploss order to maintain secrecy of your stoploss order for better play . Try to win every trade …learn positive trading and prediction of future price seeing real time chart plus use of technical indicators. Trade according to trend ..
Gap up opening is expected It was noticed on Friday that after gap down opening nifty recovered fully and closed in green zone above 11 points . Gap down opening with profit booking / short creation on swing highs on Friday 14 Mar 14…Bears have taken control on situation from 6588 and it was advised at 10.57 AM yesterday to yahoo group … eod nifty chart ended making long legged doji …learn about doji ..
Buy call at open and sell call at appropriate level after profit booking message can be learnt by each and every trader easily …see one more example of intraday sell and buy on same scrip which were worked well …. Flat to positive opening is expected with increased volatility as trading at or near record high levels big players are busy in making money by index management smart money is going out and market is still holding 6500 level is clearly indicating that a bubble is there which may burst any time …hourly chart is showing 70 80 points range trade since last 3 sessions 6515 6585 ..daily chart is showing last 3 4 candles which are indicating for trend reversal at this juncture …gann reversal time is there http://dhanvarsha.in/flat-opening-expected-11-march/ Advising to trade cautiously … positional traders may initiate shorts below 6500 level till then trade intra according to up or down swings …we are not advising to initiate long trades only advising short with proper stoploss management and small targets ..once range will break below 6500 it will take only 3 to 4 sessions to reach to 6200 .Upside already mentioned that 6700 to be sent that too by short covering as market is looking overbought . We are advising trades on the basis of technical analysis seeing past price action ,support / resistance ..change in open interest considering gann , fib , dow theory, different chart patterns , elliotwaves and few technical indicators & candle stick signals..it may or may not work some times for that we are advising to trade with proper stoploss . Prices may take U turn at level and any time so advising to lock gains with moving of stoploss order or booking gains near each target level. too book small gains u need to pay zero brokerage …for that contact us ..to learn all above facts also contact us ..we are here to guide you online ..you can learn easily while sitting at your home at your comfort. It is time of turn as per Gann dates …. W D Gann through his extensive research have found that on certain dates of month market trend changes. Gann says that these days the Sun comes at 15 Degree and 90 Degree with earth. These are very significant positions , market sentiments changes on these dates. Listed below are the important Gann Dates. Sometimes Gann dates are exact and at times it is a day or two ahead or behind. Remember that we are looking for price and time to meet and become balanced. There are times when price is ahead of time and time is ahead of price. Once we convert these degree into days you get the dates the market makes major highs, lows, tops and bottoms. The market breadth, indicating the overall health of the market turned negative from positive in early afternoon trade. On BSE, 1,323 shares dropped and 1,141 shares rose. A total of 130 shares were unchanged. The Indian rupee, which rallied to a three-month high last week, is unlikely to maintain the momentum this week due to higher demand for dollars from importers and rise in the greenback after strong non-farm payrolls data in the US last week, say bankers and experts. “The rupee is at the 61 level, and at this level we will see lot of buying coming in from importers,” said KN Reghunathan, treasurer at the state-run Union Bank of India. positive to gap up opening of 15 20 point may be there…channel breakout was spotted yesterday , either pull back or new channel formation will be decided in coming sessions …yesterdays candle was hang man its confirmation is due . It is Friday and out of 100 , 80 were bearish let us see will it go to 80 or 20 side …?